Here are some facts about the White Cliffs of Dover. 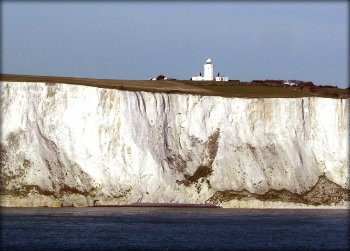 The White Cliffs of Dover are part of the North Downs and are a well known feature of the English coastline. They are often seen as a symbol of England. The cliffs face Europe, across the narrowest part of the English Channel. For centuries, they have been the first or last sight of England for both travellers and invaders. The cliffs run several km west and east from the port of Dover, in Kent, and are up to 110 metres high in places. On a clear day they can be seen from France. The White Cliffs of Dover were an important part of the British defences during both World War 1 and World War 2. Protective trenches dug across the cliff tops can still be seen today. In 1929 an aerial ropeway was built across the cliffs to carry coal to Dover. The ingenious system was about 10 km long and could deliver 500 tons of coal per hour. Two herds of Exmoor ponies were introduced to roam wild on the cliffs. The hardy ponies keep the grass short, eat bushes and help strip the bark from trees. There are secret tunnels under the cliffs, carved during the Napoleonic Wars by prisoners in Dover Castle. Winston Churchill later used the tunnels for his World War 2 headquarters. Erosion is a constant problem, with large sections of the cliffs sometimes collapsing. In March, 2012 a huge section collapsed into the English Channel. The famous white cliffs are mentioned in a poem by Rudyard Kipling, as well as one of William Shakespeare‘s plays. They can also be seen in many films, including the James Bond film Moonraker. One of the most popular songs of World War 2 was (There’ll be Bluebirds Over) the White Cliffs of Dover by Vera Lynne. The patriotic song helped to boost the spirits of the British (even though there aren’t any bluebirds in England). This really helped with my home work so thank you!